Always check the feet of your pets in winter. They can crack and bleed more easily from walking on ice. Get into the habit of toweling off your pet when they come inside, and inspect their feet for any problems. Make sure you check your car before you turn it on. Engine bays are notoriously attractive to outdoor/feral cats during the winter. Clothes aren’t just for fashion! Short-haired animals especially should have a sweater or jacket for going outside. Young/sick/frail animals are even more susceptible to cold. Boots on the feet help protect paw pads from cold burn. No booties? 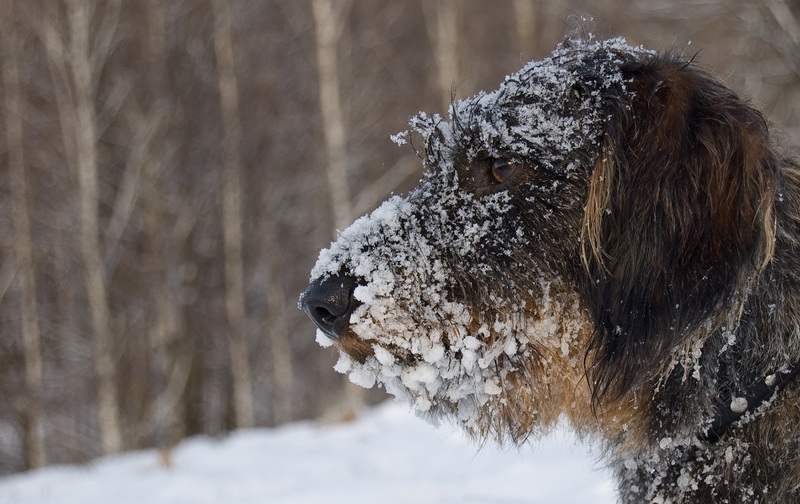 Petroleum works just as well and prevents ice and snow from clinging to fur. Grooming is just as important for pets in winter. Long haired dogs should be cleaned up but not shaved. Pets with long hair can have snowballs cling to them. Trimming their fur down can help prevent this. Always keep the fur between their toes clipped to prevent ice between their toes. Keep your pets nails trimmed. The lack of walks during bad weather days contribute to longer nails. Keep in mind carbon monoxide. You should always replace your filters in your home. This is especially important for your pet in winter time, as we spend more time inside with our doors and windows shut. We also run heaters, fireplaces, and burn candles. Carbon monoxide build up can happen more easily in the winter time. Make sure your CO alarm has fresh batteries before the cold sets in. Watch out for these hazards. Antifreeze is poisonous to dogs and smells sweet. Make sure to keep it completely out of reach as pets in winter may be more mischevious. Since your dog may be inside and bored, keep hazardous foods stored safely away. Onions, chocolate, grapes, and xylitol should never be given to dogs. Too cold for you to go outside? Then it’s probably too cold for your pet, too! Doesn’t apply to some breeds like huskies and malamutes, however even they should not be left unattended outdoors in the cold. Play with your pets indoors since walks will be limited. You can use treat balls, teach them tricks, or even take them to an indoor dog park or doggy day care to let them socialize. Fires and heaters are attractive to chilly pets. Make sure your companion doesn’t get too close, and make sure they’re never unsupervised with either. Provide a soft bed with warm blankets for your dog or cat to retreat to. Elderly dogs with arthritis will especially enjoy the extra plush beds during the cold. Keep your pets in winter warm with plenty of cushy options!